One of our most often asked questions is, "How does LP-PAN compare with the P3SVGA?" We hope that this page will answer that question. Both LP-PAN and P3 are excellent products which provide similar yet very different solutions to the problem of providing an interactive panoramic display of the band. This page is not an attempt to knock the P3SVGA, which is a very nice piece of engineering, but rather to qualify and quantify some of the differences with LP-PAN/NaP3. We thought that having it all tabulated in one place would be helpful, and save repetitive emails and phone calls. The table below summarizes the similarities and differences. Where one has a significant advantage or disadvantage, we have added green shading to highlight this. Where they are comparable, or one has a slight advantage, the shading remains grey. Following the table is a summary of operating impressions, some screen captures and a comparison video. For those who want to cut to the chase... The P3SVGA has comparable resolution, but the refresh is considerably slower than NaP3, especially if Averaging is set higher than minimum. This may or may not be important to the user. NaP3's GUI is more elegant and provides more info, plus I like the mouse interface much better and it gives me instant access to most adjustments, along with flywheel tuning. Many more settings are saved per band and per mode to optimize setups for diverse modes. NaP3 doesn't tie up an entire monitor, sothe user can run CW Skimmer on the same screen, which is MUCH better than P3 or NaP3 for CW. NaP3 displays clickable web spots in the pan window as well. The obvious advantage to P3SVGA is that it is largely plug and play. LP-PAN configuration includes the preamp option and Asus U5 USB sound card. P3 specs are taken from the P3 manual whenever possible. 1.5Hz to 97Hz (span/2048) ? Noise floor 6dB worse on P3 monitor (FFT 0.5K). 400dB range in steps of 1dB to 40dB (1dB increments). Independently adjustable for pan and waterfall for each band. 180dB range in steps of 1 dB. Adjustments are saved for each band, but pan and waterfall share the adjustment. 400dB range in steps of 1dB to 40dB (1dB increments). Independently adjustable for pan and waterfall for each band. 10dB - 80dB, 1dB to 10dB steps. Adjustable for each band, but pan and waterfall share the adjustment. Note: On some bands, strong signals are off scale at N8LP. Ease of Installation Requires installation of NaP3 software and usually an additional sound card. This requires a certain level of computer savvy. It's trivial for some --- difficult for others. LP-PAN should only be considered by computer literate users. Plug and play, but requires PC for firmware updates and additional features through P3 Utility program. Cost Total cost with Asus Xonar U5 sound card and cables ~$330. Newer desktop PCs oftern have acceptable sound cards built in, which reduces cost by $65. Assumes the existence of a suitable PC and monitor. $960 kit, $1010 assembled, plus dedicated monitor. Point/click for both VFOs in both pan and waterfall, drag spectrum for large excursions, fine tune with mousewheel, direct keyboard entry, etc. Mouse tuning rate/snap size are saved per mode. Select marker A or B, turn knob to move cursor, tap. Intangibles Also provides a full dual channel receiver with state-of-the-art DSP controls, filtering, EQ, etc. Band and Mode buttons for K3. Provides audio outputs for both Main and Sub receiver. Provides exceptional high fidelity audio output for ESSB, AM/SW broadcast, etc. Has built in telnet server and displays clickable web cluster or CW Skimmer spots in pan display. Offers function keys which will allow future control of K3 functions. May also provide future ability to display and edit K3 parameters, read PSK and RTTY, etc. P3 center frequency is tunable over a wide range, while LP-PAN is xtal controlled. 1. 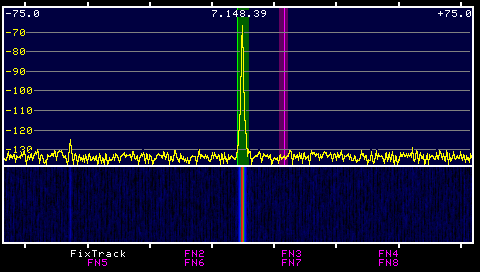 P3SVGA slows down considerably at 150kHz span, then speeds up again above 150kHz. 2. P3SVGA refresh rate measurements were made by timing the P3SVGA waterfall and dividing the number of vertical lines written by the total time needed to write them. Measurements were made with a 1920 x 1080 monitor. Refresh was checked in both "fixed" and "tracking" modes. At most spans the refresh is 6-7 frames/sec. It drops to 3 fps at very narrow spans, and <2 fps in the area of 130-150kHz span for some reason. I checked with another user and he verified this behavior. 3. While it may look like NaP3 has an advantage here, because of the differences between fixed and variable sampling, these are comparable. 4. Measurements were made with P3 and LP-PAN connected directly to K3 IF OUT (not through P3 splitter). LP-PAN measurements made with E-MU 0204. Sound card sampling set to 192kHz. Noise floor would be 3dB better with 96kHz and 6dB better with 48kHz sampling. 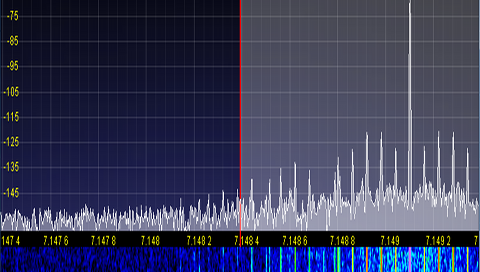 Screen grabs of NaP3 and P3 below at spans of 150kHz and 2kHz. The NaP3 pictures are cropped and zoomed down to match the 480x272 captures from the P3. Important note: The P3 SVGA output has 6dB lower noise floor than the P3 pictures shown because the SVGA output uses 4x larger FFT. 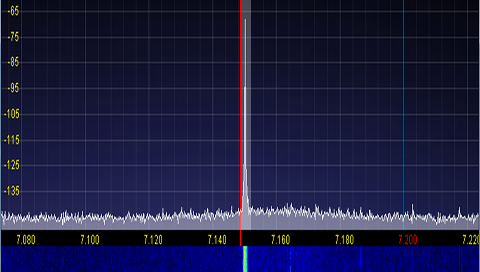 Above... LP-PAN 2 / NaP3: 150kHz span, 192kHz sampling, 16K FFT... P3: 150kHz span. These comments address only the pan/waterfall display and not all the other displays and the SDR receiver features of NaP3. Keep in mind that I have been using LP-PAN and some form of PowerSDR for a number of years, while I have only been using the P3 for about a year, and P3SVGA for a week. Also, I believe that there are some bugs in the P3SVGA that will undoubtedly be fixed at some point. I like the flexibility of NaP3 better, and much prefer the mouse interface over the menus and knob of the P3. This goes for clicking on signals for VFO A or B, as well as smooth mouse flywheel tuning of either VFO. I can easily change tuning step size or "snap" settings, adjust span and reference levels with the mouse... and all settings are saved in the band stack with band and mode. For instance, I can have 1kHz or 5kHz snap settings for AM/SWL and down to 1Hz or 10Hz snap size for PSK. NaP3 can also display optional mode, band and filter buttons for quick QSY or mode changes. With the K3, that's a big feature ;-) With the P3, I am constantly moving between K3 and P3 buttons, and the P3 needs to be weighted down to prevent it moving when pressing the knob to QSY. With NaP3, I rarely touch the rig except to adjust filters or DSP settings. Also, the NaP3 GUI is more elegant, with much more information available on screen. NaP3 supports virtually any monitor, any resolution and any vertical frame rate using inexpensive or even built in video cards. P3 offers only a few resolutions, and appears to be picky about the monitor. For one thing, it uses nonstandard H & V sync rates, which some of my monitors had trouble interpreting. Filter passband overlays are easier to see on NaP3 and can be customized for color and opacity to suit user taste. And, of course, NaP3 doesn't tie up an entire monitor. It can be resized and positioned anywhere on the screen to allow other programs, like CW Skimmer, to share the screen. 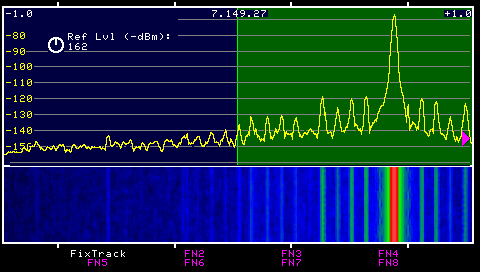 This is important to me because CW Skimmer is much better than either NaP3 or P3SVGA for CW signals. Dynamically, the P3SVGA seems to be barely able to keep up while NaP3 loafs along at <20% CPU utilization on most modern PCs. Screen refresh is "steppy" even at 200kHz span on P3, while NaP3 will easily run in real time at any span on any reasonably modern PC. P3SVGA looks even slower is Averaging is set higher than minimum, and P3SVGA slows down to a crawl at certain span settings. While tuning, there is a lag between VFO A and B markers in fixed mode. It's interesting to note that the P3 external display refreshes about twice as slow the little display in the P3. I measured between 1 and 4 minutes (varies with span) for the waterfall to move from top to bottom on the external monitor with the waterfall at half height. This is a bit of a problem, especially in fixed mode, because whenever the passband indicator hits the screen edge, the waterfall clears and starts over, losing all history, and taking quite some time to develop a new history. There are still some bugs with the external display, cursors, recalling of settings and things lining up properly as well. Addendum... With the latest firmware release, P3SVGA now supports data mode display of received text and keyboard input to provide data mode operation without a PC. Below is a comparison video showing NaP3 and P3SVGA at N8LP with the IF signal for LP-PAN routed through the P3. The mp4 version is a bit cleaner and smaller, but won't play on older versions of Windows Media Player. The NaP3 monitor is 1680 x 1050 (22") and the P3 monitor is 1280 x 1024 (21"). P3 and NaP3 are set for the same REF level, vertical scale and span (150 kHz). The video was shot at 720P / 30 fps (frames/sec) and resized to 360p. It easily shows the speed differences between NaP3 (30 fps refresh rate) and P3SVGA (2 fps refresh rate at this span). This is the slowest span I found, but is one I use a lot. Other spans can go as high as 8 fps, with 6-7 fps being typical. The clips are 10 seconds long. Setting your player for repeat mode will make it easier to watch by looping the video continuously. Even with the compressed video, it's easy to see the differences, especially in the waterfall. The flicker you see on the P3 external monitor is caused by the SVGA board not running at a 60Hz vertical sync rate. It is not visible to the naked eye.